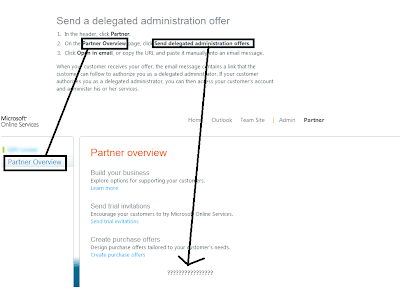 The Office 365 partner experience. Is Microsoft trying to get rid of us? I originally wanted one blog post, but, it turns out that I had more to say than I thought, so, I am doing this as a two parter! Click here to read My take on Google Apps Vs Office 365 . I first heard about Office 365 at a Microsoft partner briefing towards the end of last year, I have been wanting to sign a customer up to it for a while, but, I was simply not willing to do it whilst it was in Beta. Now it is out, this blog post will give my experiences as a Microsoft Partner. I have already given my experiences as a user comparing it to Google Apps in the first part. To get started - As I hope it came across in the first part, I really think Office 365 is a good solution, but, for the partner experience - I simply hate it! It is my honest belief that Microsoft are trying to cut partners out and that we are a complete after thought for Office 365. The only controls available to partners are to send a trial code and to send a purchase offer at the end of the trial.... This is really just about it! So, with one customer, I sent them a 30 day trial for Office 365 Plan E3. It became clear during the trial that they had no intention of using any of the additional Office 365 features and simply wanted Exchange Online. Here comes the first problem! Almost no one at Microsoft seems to understand the different plans on offer through Office 365! I rang up the support line three times, firstly I got a "No, not possible", next I got a reassuring "Yes, I think it is possible, You may loose all data during the move", and then the third time I was told that they would look in to it and get back to me. However, I was far from convinced and purchased a licence myself in order to test the scenario - this is one of the major faults with Office 365 - Whilst there is quite a bit of help and support listed, there are not enough real world situations and examples. When I ring up the helpline, all they seem to do is a search of the same knowledge base and if they can't find an answer, I get the impression that they just guess. In the end, I found out that it is perfectly fine and I was able to migrate my customer easily, without losing any data (or having any down time). But, if so many people from Microsoft do not understand the different subscription levels, I do not know how they expect us to! That being said, it isn't really that hard and I knew the levels, which is why I was so annoyed at Microsoft not knowing and giving me silly answers back. Again, I just feel that the partner experience was an after though. There is no way that I have seen to manage clients at all. There is a section about delegated administration - but... it doesn't work at all. The option is simply not there. So, the best I have been able to do is to create an administrator account for myself under my clients account - it is not ideal, but it works. I feel that Microsoft are really screwing partners in two ways. Firstly, the new hosted Exchange solution costs less and offers more than any hosted solution from any partner I have seen - I simply do not know why any partner will want to offer their own hosted Exchange going forward. And next, the partner fees for Hosted Exchange are 6% for the time you are the partner on record and a further 12% for the first year of signing a company up, meaning that if you are a partner who signed someone up during the first year, you can earn a combined 18%/ However, once again, due to the way the partner system works, and the fact that there is a 30 day grace period, at the end of one year, you are much better off simply ditching/letting a license expire and signing your customer up to a brand new 1 year licence. This results in the customer getting a free month and the partner getting another 18% for the next year instead of just 6%. I just have very mixed feelings over Office 365, I believe that it is probably the best solution out there, but, I really hate the partner experience, or complete lack of one. ... When I say this, I am not talking about ripping off my customers in any way, simply put, I have always been used to giving my clients a single bill at the end of every month or quarter which covers everything I do - email hosting included. I find it annoying to change my business processes to have to fit in to the way that Microsoft thinks is best. I feel it would be so much better if they simply offered licences to partners for sale at 18% off the retail price and let us do what we like with our clients. I for one would love this and by far think it is a superior solution. However, again, I do not see Microsoft doing this any time soon, I think they have slapped together the bare minimum to call it a cloud partner program and are going to leave it there. I just don't think Microsoft understands the relationships that support companies have with their clients, I would be willing to get a cheaper licence without end user support thrown in... That line must cost a bit to have and the whole point of being a partner is that we want to be the single point of call for our clients. I just think within the next few years, we are going to see a lot more of Microsoft targeting end users directly and attempting to cut out partners as much as they can. Going back to this support line - It is the most stupidest use of VOIP and localisation I have seen - No matter what country you ring from, you get forwarded to the same country/target, but, it is only open during working hours in your country. I had an urgent issue in the middle of the night, so, I rang up the Australian help number and it was the exact same IVR/Option, and I went through to the same help line! Why can't they just keep the number open 24x7? And... If anyone wants any free trial links to Office 365, here are some for you! If you want to purchase Office 365 and do not have a partner, feel free to get in contact with me and I will be happy to set you up - I would still say I am a Microsoft fan and I really hope they improve the partner program, I for one would love to be proved wrong on many of the points I have made here - I just unfortunately do not see it happening. I still feel Office 365 is a brilliant solution... Just not for partners!